CRISPR-Chip - an integration of the CRISPR-Cas9 complex and Graphene Biosensors resulting in the first ever "DNA Search Engine". Imagine a tiny robot that was programmed to unzip the DNA double helix, search through the whole genome, identify a match to any sequence you’d like, and if you asked it to, it could then further edit the genome to your liking. If you’ve worked in molecular biology recently, you know we’re describing the CRISPR-Cas9 system. It is one of the biggest science breakthroughs of modern time, if you ask us. And this system is becoming globally famous for the ease with which it can edit genes in humans. But, really, we think it is first and foremost its impressive ability to search though a whole genome in record time that makes the CRISPR-Cas9 system truly impressive. Molecular biologists aren’t generally going to describe their research subjects as tiny robots, but this is how engineers and laymen from other disciplines best will understand them. We admired the “biology searching engine” function that is performed by proteins and RNA and we realized there was no way we could design anything so effective and elegant. So the question became: Can we integrate this nature-perfected design as a component in a piece of technology that fits into our current engineering worldview of apps and instant Internet feedback? If we could use this impressive molecular searching machinery to design DNA measurement tools, we could simplify the common process of DNA and gene measurements for many applications that currently require DNA amplification. Amplification has many problems that we’ve all simply come to accept. We shouldn't. For example, in any sort of clinical environment, use of DNA amplification requires minimum three separate workflows: one for sample preparation, one to run the amplification, and one for detection and analysis. If we don't need to amplify, operating a clinical lab becomes significantly cheaper, faster and easier – maybe even someday a handheld lab-on-a-chip kind of thing. In our Nature Biomedical Engineering paper, we show that amplification isn't necessary for quick and targeted DNA and gene detection when we combine our biological genome searching CRISPR robot with our highly sensitive nano-electronic biosensor system. Using this new combined system, we can observe a signal, from CRISPR working, directly on our computer screen. All that is needed is to simply monitor the RNA bound Cas9 protein activity in real-time, and convert its molecular binding activities to a digital stream of data. Direct electrical integration of our bio-robot with a nanoscale transistor capable of sensing the interaction between the electronically charged molecules of CRISPR and DNA seems to be a very powerful solution for a number of current challenges. So how did we directly integrate biology with computers via nano-electronics? In our paper we are introducing a new way of insight to CRISPR-Cas9 activity in almost real-time. We understand this might sound pretty fantastical, but never the less, that is exactly what we did by integrating CRISPR and graphene biosensors. Graphene is the most popular nanomaterial, and for good reason. It is a sheet of one atom thick carbon and the first two-dimensional semiconductor discovered. It has properties like high electron mobility and chemical stability in salt water that make it an ideal electrical conduit for reporting the activity of our biological machinery. In all honesty, there’s really a very small list of materials and approaches that could work at all to directly read out activity of the CRISPR system. Optical techniques don’t have the speed to follow the Cas9 activity rapidly or require incorporation of optical labels and/or amplification. Silicon based electronics lack the sensitivity required for detecting the activity of CRISPR machinery, and silicon does not play nice with biological material nor salt or water. To do all of that we needed a sensitive electronically active biocompatible material: Graphene. We started the integration between the CRISPR and graphene biosensor with great enthusiasm, but we faced many challenges. Biological machinery like CRISPR is complex, and we needed to run a few hundred measurements to make sure we understood what was happening. The number of graphene biosensor chips required and the cost of fabrication process would bankrupt most academic labs in the pre-commercial-graphene world that existed back when my lab started this work. The labor intensive methods available via academic literature, and the extreme consistency required for the graphene we needed, would drive most postdocs and graduate students crazy. It was a bit of serendipity that led us - Brett and myself - to meet through a friend at an ACS conference and realize that one of us had this really great “gene search engine” application that required a large number of very consistent graphene sensors while the other one had spent years working on exactly how to produce a large number of quality graphene biosensors at low cost, but was still looking for a killer application. And just like that we were able to rapidly combine two new areas of science into one new technology that we are now sharing with you in our publication. To build our system we used a modified version of Cas9 protein (dCas9) within the CRISPR complex so that when it finds the matching DNA sequence to the guide RNA (the search query), it holds on rather than performing a cut to edit. We then put thousands of these neutered Cas9 enzymes on each graphene sensor using special chemical linkers. We ensured that the CRISPR system remained active after this attachment, which took some time and the work of many of our lab members to optimize, but it worked out. 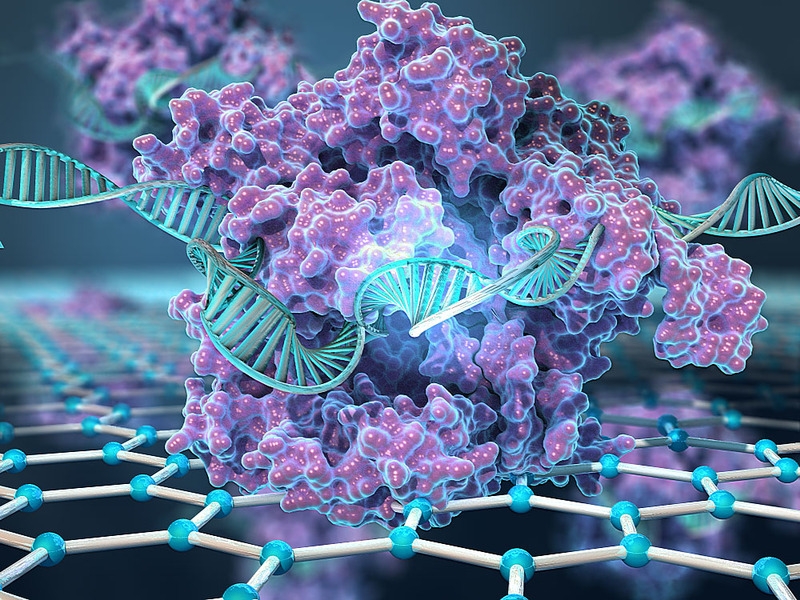 With an active dCas9 on the graphene surface, we were able to sense the change in energy that occurs at the surface of the graphene when the CRISPR holds on to the part of the genome it was designed to find. That integration established the name “CRISPR-Chip,” which is a straightforward way of showing the integration of the two technologies into one. To test the integration of parts within the CRISPR-Chip, we started by testing it for the detection of target sequences in non-clinical DNA samples which worked well. We then moved on to validate CRISPR-Chip to detect target sequences in DNA samples obtained from patients with confirmed Duchenne muscular dystrophy (DMD), a genetic disease resulting in muscle degeneration and weakness. The speed with which we moved from basic function to testing with human DNA was a bit head spinning, but the data was clearly indicating that our bio-robot-nano-electronic system was functioning. The combination of nano-transistors and CRISPR enables us to exploit the simple programmability of CRISPR to design thousands of transistors in parallel that can function and deliver the CRISPR search results electronically at once in the palm of your hand. This can expand the applications of CRISPR in digital diagnostics very quickly and much faster than its therapeutic applications, as we still have to overcome many challenges to achieve safe and effective gene editing in humans. But diagnostics is not the only application of the CRISPR-Chip. For example, the CRISPR-Chip can be used to improve the efficiency and safety of CRISPR gene editing. In vitro, validation studies are often required to maximize CRISPR efficiency. However, these studies mostly assess the CRISPR molecule efficiency at the immediate vicinity of the target. Off-target CRISPR activities, as it can cut or edit in unintended places in the genome, is a real problem we have to minimize at all cost as we move toward CRISPR for therapeutic use. Undesired CRISPR effects, including deletions and modifications that occur far from the targeted gene, could potentially result in serious clinical outcomes. In addition, most efficient gRNAs, that are often selected after gRNA validation studies, may not perform the same in-vivo due to the complexity of genome which differs from the naked DNA often used in validation studies. We simply need to have tools that can provide a deeper level of insight before we get ahead of ourselves with human genome editing. Therefore, we are very eager to further develop CRISPR-Chip for CRISPR quality control (CRISPR QC) for evaluating “on-target vs. off target” and for gRNA validation. We are confident that CRISPR-Chip can provide us with valuable information about CRISPR efficiency and safety. In other words, we want to be able to read out what's actually interacting with CRISPR and not just the best-guess and other proxies for the reality. Biology, and gene editing, is complex. Our genome is very complex. It is not simply a linear code that is followed by cells. Amplification and labeling of DNA adds more complexity. Our vision is to use technological advancement in the digital world and build tools to provide us with instant access to the world of biology.